Here’s another contest winner from Taste of Home magazine. I know I keep saying these are among my all-time favorites but they really are! ‘Cause what else would I enter into a recipe contest, right? This recipe calls for some ingredients you'll likely not have in your pantry so you're going to have to invest a few bucks. But once you cook with them (especially the hoisin, sriracha, and sesame oil), you'll fall in love and find a bazillion dishes you want to add them to. Again, I’m obnoxiously proud of the reader reviews I’m seeing on the T of H website and have to share them! Awesome! 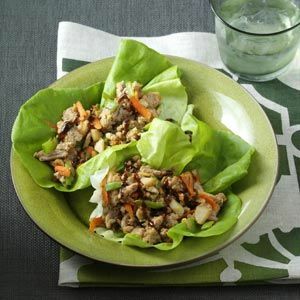 I have tried several lettuce wrap recipes and have been disappointed with the lack of flavor. This has so much flavor! I added frozen peas instead of snow peas and it was great. My whole family loves this dish! We eat it as the main dish, but it would go great with any kind of Asian dish. Full of flavor and so easy to make. My grocery store did not have Bibb lettuce so I just used iceberg and it was fine. These are super easy and so yummy! I make these all the time for lunch. I find myself craving them all the time. I use Romaine lettuce and it works just as well. Crazy messy, but worth every delicious bite... This comes together in a snap and is surprisingly filling. We took leftovers to work the next and stuffed them, lettuce and all, in a whole wheat wrap. YUM. I've made lettuce wraps before. I cannot believe how easy and delish this recipe is.I made this dish last evening for Hubby and myself. I thought about the leftovers all night and could barely resist heading to the kitchen in the middle of the night. I didn't change a thing about the recipe and it was just PERFECT! It's a five-star recipe that I know I'll make again and again. Easy to make and SO yummy! In a large skillet, cook turkey (or pork) and carrot over medium heat until meat is no longer pink and carrot is tender; drain. Add ginger and garlic; cook 1 minute longer. Stir in the water chestnuts, onions, snow peas, teriyaki sauce, hoisin sauce, sriracha, peanut butter, rice vinegar and sesame oil; heat through. When ready to serve, divide among lettuce leaves. Drizzle with additional hoisin sauce if desired. While sharing links to South Your Mouth © 2011 is welcomed and encouraged (please and thank you! ), do not copy/paste full recipes to any social media (Facebook, etc. ), blogs or websites without express written consent. Unauthorized use of content and photos from South Your Mouth © 2011 is a violation of both the federal Digital Millennium Copyright Act (DMCA) and copyright law. I really don't know but I did find this... http://answers.yahoo.com/question/index?qid=20080417053703AAeOzo0. Hope this helps! I tried it with plum sauce once, not quite the same taste, but it worked. I make this recipe all the time. My husband says it's as good or better than the ones at PF Chang's. I made this today for lunch with a friend. I didn't have the water chestnuts or the Sriracha. It was fantastic! I'm sure the water chestnuts and the sriracha would have made the dish even better. I will be adding this to my list of keepers! We both felt that not only was it great in the lettuce cups but it would be equally as good just over rice. It could also be easily adapted to a vegetarian dish by omitting the meat (need to double check the ingredients). The sauce is the star here. Thank you! Keep up the great work Mandy!